Catch up on your state trivia with these North Dakota history firsts and interesting fun facts about the state. 1740 - The Big Hidatsa village site was occupied from about 1740 to 1850 and is the largest of three Hidatsa communities near the mouth of the Knife River. It is believed to contain the best-defined earth lodge depressions of any major Native American site in the Great Plains. 1829 - Fort Union Trading Post was the principal fur-trading depot in the Upper Missouri River region from 1829 to 1867. 1876 - Colonel Clement A. Lounsberry, a Bismarck journalist, won fame for his reporting of the route of General George A. Custer at the Battle of the Little Bighorn in 1876. 1883 - Located southwest of Medora, De Mores State Historic Site memorializes the life and activities in North Dakota of Antoine de Vallombrosa the Marquis de Mores who arrived in 1883. Among his enterprises were a beef packing plant, a stagecoach line, a freighting company, refrigerated railway cars, cattle and sheep raising, land ownership and a new town which he called Medora. 1884 - Chartered in 1884 Jamestown College is the oldest independent college in the state. 1886 - Named after Henry D. Minot, a young entrepreneurial visionary from the east, the town of Minot was conceived in the late 1800s. With the impending arrival of the Great Northern Railroad the town site was actually selected in November of 1886. Its phenomenal growth led to the early nickname Magic City. 1890 - Sitting Bull Burial State Historic Site located on the western edge of Fort Yates marks the original grave of the Hunkpapa Sioux leader. During the Ghost Dance unrest of 1890 an attempt was made to arrest him at his home on the Grand River in South Dakota, and a skirmish ensued in which Sitting Bull was killed. 1907 - The Wild prairie rose, (Rosa blanda or Rosa arkansana) becomes North Dakota official state flower. The flower sports five bright pink petals with a tight cluster of yellow stamens in the center. The state rose grows along roadsides, in pastures and in native meadows. 1909 - Ellendale's oldest attraction is the Opera House. Built in 1909 it has a seating capacity for 1000 patrons. 1924 - Lawrence Welk left his home in Strasburg on his birthday in 1924 to pursue his musical career. On July 2, 1955, he made his debut on national television. The Lawrence Welk Show was produced for 26 years and today reruns of the popular program air weekly throughout the United States and foreign countries. 1934 - From 1934 to 1941 the Civilian Conservation Corps maintained a base camp near Medora to perform landscape and restoration work on the 128 acre Chateau de Mores State Historic Site and the de Mores City Park, which opened to the public on August 7, 1941. An attempt to drop the word North from the state name was defeated by the 1947 Legislative Assembly. Again in 1989 the Legislature rejected two resolutions intended to rename the state Dakota. The American elm (Ulmus americana) is the official state tree of North Dakota and is commonly found across the state. The American elm often reaches 120 feet or taller. 1956 and 1957 - The International Peace Garden straddles the international Boundary between North Dakota and the Canadian province of Manitoba. In 1956 the North Dakota Motor Vehicle Department, on its own initiative, placed the words Peace Garden State on license plates; the name proved so popular that it was formally adopted by the 1957 legislature. 1960 - This name Roughrider State originated in a state-supported tourism promotion of the 1960s and 70s. It refers to the First US Volunteer Cavalry that Theodore Roosevelt organized to fight in the Spanish-American War. 1982 - Rutland hosted what was considered the grand daddy of all celebrations when the town went into the "Guinness Book of World Records" with the cooking and eating of the World's Largest Hamburger. That year, between 8 and 10 thousand people came to sample the tasty 3591 pound burger. 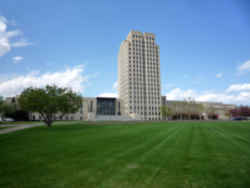 1987 - Passed a bill making English the official state language of North Dakota. Westhope located on US Highway 83 is a Port-of-Entry into Canada. Each year more than 72,000 vehicles cross the border at this point. When Dakota Territory was created in 1861 it was named for the Dakota Indian tribe. Dakota is a Sioux word meaning friends or allies. Dakota Gasification Company in Beulah is the nation's only synthetic natural gas producer. Bottineau is the southwestern gateway to the Turtle Mountains, Lake Metigoshe and the International Peace Garden. Petroglyphs carved into two granite boulders give Writing Rock State Historic Site near Grenora its name. Though their origins are obscure, the drawings probably represent the Thunderbird, a mythological figure sacred to Late Prehistoric Plains Indians. Outlines of the bird, showing its wings extended and surrounded by abstract designs, appear on both boulders. The Canadian provinces of Saskatchewan and Manitoba on the north, Minnesota on the east, South Dakota to the south, and Montana as its western neighbor border North Dakota. Max G. Taubert of Casselton built a 50 foot high pyramid of empty oil cans. It is believed to be the highest oil can structure in the world. Devils Lake is the largest natural body of water in North Dakota. Devils Lake derives its name from the Native American name Miniwaukan. Early explorers incorrectly translated the word to mean Bad Spirit. Bolstered by the many legends of drowned warriors and lake monsters the name evolved into Devils Lake. This very fertile prairie lake grows large numbers of the fish known as walleye, northern pike, and white bass. The lake has earned the reputation of being the Perch Capital of the World. International Peace Garden, which lies partly in North Dakota and partly in Manitoba, Canada, honors the long friendship between the two nations. The restored boyhood home of band leader Lawrence Welk stands in Strasburg. The Maah Daah Hey Trail, crossing about 100 miles of badlands in western North Dakota, is informally known as the Moab of the North, gaining national prominence as a mountain bike trail. Also a hiking and horseback riding trail. The third largest man-made lake in the United States, Lake Sakakawea was created out of the Missouri River by the Garrison Dam, the fifth largest in the United States. The 609-square-mile lake has 1,500 miles of shoreline. North Dakota has more wildlife refuges (64) than any other state. California is second with 38 refuges; Florida follows with 29 refuges. A flowering monument to peace is the International Peace Garden, straddling the border between the United States and Canada. Near Dunseith, this 2,300-acre garden plants 100,000 flowers annually and features a Peace Chapel as well as an 18-foot floral clock. Theodore Roosevelt National Park is carved out of the North Dakota badlands, a 70,000-acre monument to the forces of nature. Its rugged topography is credited with molding Theodore Roosevelt, who arrived in 1883 to hunt and later established the Maltese Cross and Elkhorn cattle ranches. Later, as 26th president, Roosevelt would say, "I never would have been President if it had not been for my experiences in North Dakota." The Dakota Dinosaur Museum in Dickinson houses twelve full scale dinosaurs, thousands of rock, mineral and fossil specimens and a complete real Triceratops and Edmontosaurus. Richardton is home to the Abbey Church a Barvarian Romanesque structure. Lofty arches, 52 stained glass windows, 24 paintings of Saints on canvas above the arches, and a huge carved crucifix delineate the impressive interior. The Lone Tree Wildlife Management Area located southwest of Harvey consists of 33,000 acres of gently rolling hills bordering the Sheyenne River. The North Dakota State University research experiment station in Hettinger is the largest state owned sheep research center in the United States. The World's Largest Buffalo monument is located at Frontier Village in Jamestown. The structure is 26 feet high, 46 feet long, and weighs 60 ton. Kenmare is the Goose Capital of North Dakota. Kenmare is the hunting haven of the north with an annual snow goose count being over 400,000 birds. Flickertail refers to the Richardson ground squirrels which are abundant in North Dakota. The animal flicks or jerks its tail in a characteristic manner while running or just before entering its burrow. Killdeer Mountain Roundup Rodeo is the home of North Dakota's oldest PRCA rodeo. President Theodore Roosevelt first came to Dakota Territory in September 1883 to hunt bison. Before returning home to New York, he became interested in the cattle business and established the Maltese Cross Ranch and the Elkhorn Ranch. The world famous Paul Broste Rock Museum in Parshall is built of natural granite quarried from the area. The entire structure was constructed with volunteer labor and opened for business in 1965. Paul called it his Acropolis on a hill. New Leipzig is known as The Small, Friendly German Town on the Dakota Prairie and hosts an annual Oktoberfest. The annual Central North Dakota Steam Threshers Reunion is one of New Rockford's main annual events. It is held the third weekend of September and boasts a variety of antique farm machinery . Founded in 1978 Fort Berthold Community College is a tribally chartered college located on the Fort Berthold Indian Reservation near the town of New Town. Niewoehner Funeral Home in Rugby has changed the skyline of Rugby with the construction of a 30 foot tower containing 13 bells. The largest bells, of which there are two, are 40 inches in diameter and weigh about 1,300 pounds each. Only one word is needed to describe Lake Sakakawea country - big. From the massive two-mile long Garrison Dam near Riverdale to the end of Lake Sakakawea near Williston, Lake Sakakawea is nearly 200 miles long with a shoreline of countless bays and inlets that cover 1,600 miles. The rich heritage of Grand Forks is preserved at the Myra Museum featuring an 1890's home dedicated to pioneer women, a one-room school, carriage house, and the city's original log Post Office. Turtle Lake celebrates turtles, hard-shelled reptiles often found in the water. Turtle Lake has erected a two-ton sculpture of a turtle near the entrance to the city. The town is the home of the annual United States Turtle Racing Championship. 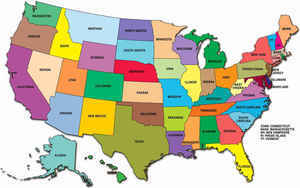 Of the 50 states North Dakota is 17th in size, with 70,665 square miles. North Dakota is 212 miles long north to south and 360 miles wide east to west. The Lewis and Clark expedition encountered their first grizzly (brown) bears in North Dakota. A 12-foot-high bronze statue of Sakakawea and her baby son Baptiste stands at the entrance to the North Dakota Heritage Center on the state capitol grounds in Bismarck. The statue, by Chicago artist Leonard Crunelle, depicts Sakakawea with her baby strapped to her back and looking westward toward the country she helped to open. The piles of rock on White Butte, North Dakota's highest point, are known of as rock johnnies or sheepherder's monuments and according to legend were piled there by sheepherders as a way to pass the time while they tended their flocks. Only the Best Come North is the motto of the Minot Air Force Base located a few miles outside Minot's city limits. The military community draws personnel from all over the world.